Many time we need to Record the Call on Our Android Device, sometime to save the memory of someone and sometime for some different purpose, that’s why I am going to tell you about how to Record Calls on Xiaomi Redmi Note 4, Redmi 3s Redmi 3s Prime and other Redmi Phones. I would like to tell you all that MIUI has some very unique features inbuilt, and Call Recording is one of them, Many Android phones has no such feature which allows to Record calls without any app, but Xiaomi Always Bring these kind of useful features to us. So to Record Calls on Redmi Note 4, Redmi Note3, Redmi 3s Prime, you don’t need to download any third party app, you will be able to Record Calls Automatically, after following the below steps. 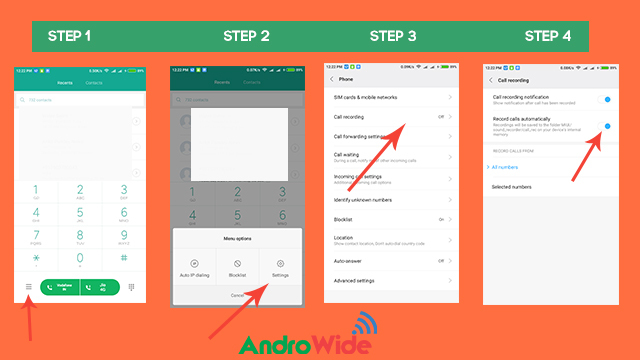 And these steps are like eating Paneer Pulav, I meas this method to record calls on a Xiaomi Device is very easy. How to Record Calls in Xiaomi Redmi Note 4, Redmi note 3, Redmi 3s Prime & Others. Steps are just below, Go Grab it. That’s it now All calls will be Recorded Automatically on Your Redmi Device, and you will be able to see the Call Recording Notifications as well. Now you can also customize that do you want all numbers get recorded or you want to choose some specific number’s to be get recorded.